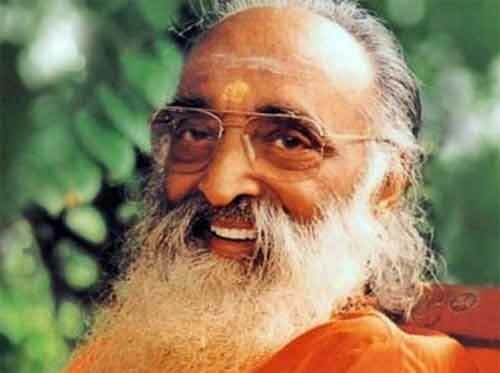 Swami Chinmayananda (1916 - 1993) shares his thoughts on Love. He says that we need to stop the feeling nobody loves me. Very often we hear some people complaining that "nobody loves me." The world is full of love. But generally our hearts are not open for the love to gush into us. And the door of your heart ever remains closed. Nobody other than you can ever throw it open; for the door of your heart cannot be locked from outside and it can be open only from within. You alone are in your heart. You unconsciously got locked in and you cry out to others to open up and release you. Nobody can. Stop crying. Open up and receive all love. Love is the heart of religions, the theme of all classical works of art and literature and the song of all devotees. Scientists know only what love does... not what love is. Love can indeed empty our asylums, perhaps all our prisons, may be all our hospitals. People suffer in life due to lack of love. Love is to human hearts what sun is to flowers! Love grows with knowledge of the beloved. To love, therefore, is to know... yet, to know is not necessarily to love. We may often give without love, but we can never love without giving. Love is at once noun and verb... Love is something to be sustained and fulfilled, by loving. By loving alone can love be made to grow and thrive. And our work is love made visible! When love is made to manifest, work is done. When we work only to produce profit or wages, work becomes crushing, sweating, joyless labor. With love in our heart, let us put forth effort and flood the world with our work! It takes two to make a quarrel. Also, it takes two to make up (patching up) after quarrel. Without invoking love, this can never be accomplished. Flood your mind with love, look into the eyes of the other and embrace the person with whom you had quarreled. Words are not necessary. Both will have eyes flooded and joy-tears will wash away all quarrels for the time being. Try this. You will find this true every time. This is the power of love. This is the strength of love! Faults become thick when love is thin. When love rises to swirl around us, and when we review in this clear light of love, the very faults get transformed into the essential beauty in them. This is the magic touch of love, the miracle played by love. When our hearts are full of love, life is a smiling valley of beauty and joy, romantic and divine.